I'm all about the fun today. Of all the great comic-book characters launched by Joe Simon and Jack Kirby in the 1940s, save for only Captain America his own patriotic self, the Newsboy Legion are my clear favorites. Though I never had a paper route as a kid and never lived any place quite as dangerous and dismal as Suicide Slum, those feisty newsboys - Tommy, Gabby, Big Words, and, especially Scrapper - have managed to speak to me in a way no other young heroes ever have. "Glamourous" would be an insane adjective to use to describe the Legion's struggling-to-survive lives, but their battles to make Suicide Slum a better place, their general dismissal of authority, their monthly clashes with brutal criminals from their neighborhood and from across an ocean, these all strike me as being as much fun as a 1940s kid could have. Add their wonderful wacky relationship with policeman Jim Harper, who performed double role model duty as the Guardian, and you have a comics classic that is only recently getting the praise it deserves. 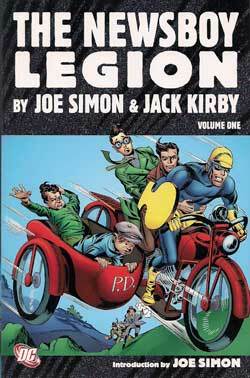 Their first 26 stories are reprinted in The Newsboy Legion by Joe Simon and Jack Kirby Volume One [DC; $49.99]. It's a handsome hardcover whose interior pages look like the actual pages of the old comic books. The adventures are a compelling mix of B-movie melodrama, slapstick action/comedy, and this sense of reality drawn from the relatively young Kirby's own experiences growing up in oft-violent New York City ghettos. Even when work was obviously rushed due to Simon and Kirby's impending inductions into the Army, there's that amazing certainty of storytelling, script and art that was the hallmark of the legendary team and their studio associates. If there was commercial value in the "Simon and Kirby" credit, it's because the readers knew those names represented entertainment and excitement far beyond the norm. Dimes were frequently hard to come by in the 1940s; Joe and Jack always made sure that their readers got their money's worth and then some. This first volume has an introduction by Simon and two stories drawn by a young Gil Kane. Even though a planned (but unscheduled at this time) second Newsboy Legion collection will contain stories written and drawn by creators who were not Joe Simon or Jack Kirby, I can't wait to read it. I love these mugs. 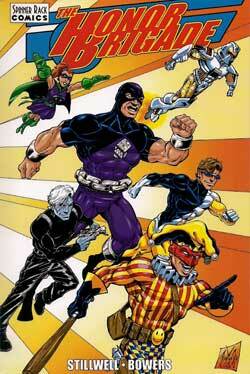 The Newsboy Legion by Joe Simon and Jack Kirby earns the full five out of five Tonys. When I read the first black-and-white issue of my friend Tom Stillwell's Honor Brigade, I thought it was a bit sparse in story and art. It needed more meat is what I told him at the time, but I applauded the fun that was there to be enjoyed. It's been a year or two since and with the passage of time has come Honor Bridage, a spiffy full-color trade paperback of the initial six-issue mini-series plus special features and stories [Spinner Rack Comics; $32.50]. I'm delighted to report the promise of that first issue has been kept. With artist Bradley Bowers, Stillwell gives us the re-forging of a super-hero team. The story has so many of the elements that mark many of my favorite genre efforts: action scenes that advance the plot, bantering that rarely seems forced, natural camaraderie between the characters, a sense of history of an earlier super-hero that informs this series but never weighs it down, sacrifice, and redemption. Oh, yeah, and just plain fun. In her foreword, comics writer Gail Simone (Birds of Prey, Secret Six, Wonder Woman) states fun is "what this book is about" and she's definitely on the mark with that assessment. There are great characters in this collection. 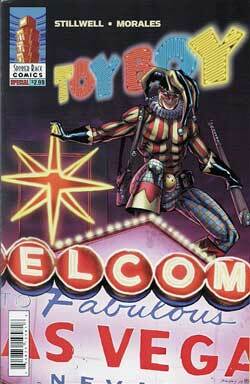 Heroes who are flamboyant, flippant, and maybe borderline crazy aren't new to the genre, but Toyboy isn't irritating like most of them. Joe Irvin, a security guard who dies before becoming an integral part of the time, could be the reader's next-door neighbor because he's so darn normal except for that he isn't anymore. The Living Log might be the best "Alfred" since Batman's butler. Besides the Simone introduction, this 208-page volume also has five short comics stories by Simone, Stillwell, and others, and a plethora of pin-ups by some very cool artists, including the always wondrous Colleen Doran. Overall, it's a collection that embraces the fun of the super-hero comics of the past without being a slave to their conventions. Its tales are suitable-for-all-ages without being lightweight. It's a book marked by cleverness of ideas and honesty of intent. I loved it. Honor Brigade earns an impressive four Tonys. Spinning off from the Honor Brigade, Toyboy: What Happens in Vegas [Spinner Rack Comics; $2.99] is a done-in-one special that starts with our exuberant hero battling a giant villain named Slamrock at a St. Patrick's Day parade and then moves on to things like him being sued by the villainous toy company from whence he, ah, appropriated his guise and weaponry, being recruited by an old associate for a government mission, and more. Between the helpful "what has gone before" block on the issue's inside front cover and Tom Stillwell seamlessly including additional background info into his script, this comic book is as new reader friendly as they get. It's also nicely drawn by Jethro Morales and, as seems to be some sort of habit with Stillwell and Spinner Rack Comics, a whole lot of fun. Which earns it another impressive four Tonys. I told you I was all about the fun today. This is "a nonprofit organization that supports lesbian, gay, bisexual and transgendered (LGBT) comics, creators, and readers." I was asked to write an article for the site discussing a couple of characters who appeared in my second Black Lightning series. The article is entitled "Walter and Samuel" and I think it turned out pretty well. There's lots of other informative, interesting stuff on the site, so give it a visit.